Following In the footsteps of Jesus, we are at one time baptised to fulfil an important task as Christians. It is inevitable that along the line feel somehow challenged and face opposition for the people to whom we sent to minister. In this way we are prone to doubt ourselves if we are the suitable people should we not be accepted as expected. It is at this juncture that we feel tempted to abandon the mission entrusted to us. It comes natural for us to expect positive results right from the onset, yet it’s not always the case with the follower of Christ. This kind of thinking comes from the notion that we want to be loved, appreciated, esteemed and accepted by all no matter what. At first you may be welcome by those to who are sent to preach or minister because the first impression you make, but during the course of your ministry they might start questioning your background. This is evident in the life of Jesus when he visited his home town. “Is this not Joseph’s son?” In spite of their lack of faith he was not at all discouraged but continued to do what he knew best and sent to do. This is the challenge posed to all of us as Christians, and that is why Jesus said, “ if anyone wants to be a follower of mine let him first deny himself and take up his cross and follow me.” Let us allow Jesus to rule in our lives because he sent us and for sure he will strengthen us when you eel weak and discouraged, for he says “ I am with you till the end of time.” Rest assured of his love and support for he has sent you to bring the good news to the poor, to proclaim liberty to the captives. 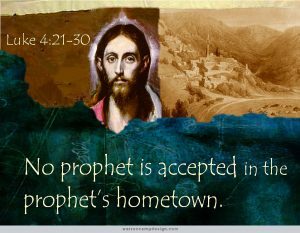 When your friend, classmates, colleagues, relatives even parents turn against you, just remember the words of Jesus, “ I tell you solemnly, no prophet is ever accepted in his own country.” Amen.